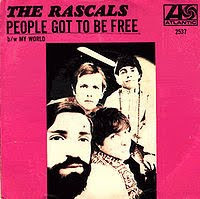 People Got To Be Free, US#1(5) from 17 August 1968, 14 weeks in Top 100 from 20 July - Big Hit in N.Z. Another big hit for the songwriters Felix Cavaliere and Eddie Brigati of the group and the fastest seller for them at that stage, reaching #1 in a month of release. According to songfacts.com, this was written in reaction to the murder of Martin Luther King, Jr. The song obtained a double meaning when Robert F. Kennedy was assassinated before the single was released. TAMMY (with Universal International orchestra conducted by Joseph Gershenson) US#1(5) from 19 August 1957, with 31 weeks in Top 100 from 22 July, and UK#2 with 17 weeks in the British bestsellers. NZ#1 in September 1957. HUGE HIT in N.Z. This is actually Debbie's second million-seller, her first being a duet with Carleton Carpenter in 1951. The song is by Jay Livingston and Ray Evans from the film Tammy and the Bachelor, starring Debbie, in which she sang it and the record is from the soundtrack of the film. MAYBELLENE, US#5, 11 weeks in Top 100 from 20 August 1955 his 1st million-seller and 1st chart, also R&B#1(11). San Jose, California born, January 1931, Charles Edward Berry became as popular as Bill Haley and Little Richard, sharing the bill with them on tours and signing with Chess and making this his first big hit. Not Released In NZ. BAD TO ME UK#1(2) from 22 August 1963. The first act other than the Beatles to have a UK#1 with a Lennon and McCartney composition. Born William Howard Aston, August 1943 in Liverpool had been a guitarist with a number of bands while still working for British Rail. He was discovered by the Beatles manager Brian Epstein while singing with the Coasters and he became Billy J. Kramer (the middle initial standing for nothing at all and suggested by John Lennon) and Epstein replaced the Coasters with The Dakotas. Kramer's first single was a cover of the Beatles "Do You Want To Know A Secret" Monster Hit in N.Z. A BOY NAMED SUE, US#2(3) from 23 August 1969 - Monster Hit in N.Z. Johnny Cash was at the height of his popularity when he recorded this song live at San Quentin State Prison in California. The concert was recorded for broadcast by Granada Television on February 24, 1969 and for the Johnny Cash At San Quentin album. The song became Cash's biggest hit on the Billboard Hot 100 chart, spending three weeks at #2 in 1969; it also topped the country music and adult contemporary charts that same year. UK#1(2) from 13 August and US#1(2) from 17 October 1964. Another #1 success in 1964 for songwriters Jeff Barry and Ellie Greenwich and MONSTER HIT in N.Z. Rock-quintet consisting of four members from Spain and one from Germany. Mike Kennedy leader with a UK#2, 9 weeks in Top 20 from 16 July and US#4, 12 weeks in Top 100 from 13 August 1966 - Big Hit in N.Z. Led by Arthur Wilson, Whitby, England born June 1944, the band included drummer Carl Palmer, later of Emerson, Lake & Palmer - Monster Hit in N.Z. US#8, 17 weeks in Top 10 from 17 August 1959. Missouri born in December 1928, a pop - country singer / guitarist who first recorded in 1951 and first charted in August 1956. This was his 4th US chart and a BIG HIT in N.Z. A trio, comprising brothers, Dean and Marc Mathis with Larry Henley. They got their falsetto sound (of lead Larry Henley) from Dean Mathis pitching to Boudleaux Bryant a Four Seasons style rendition the trio did of Boudleaux's composition 'Bye Bye Love'. Needing a fourth song for their first recording session, they picked up on a recent demo of this song, rearranged it in falsetto style, and was released as the B-side of their first 45 from 15 August 1964 - and that became their only million-seller. HUGE HIT in N.Z. US#2(2) from 19 September 1964, but charted from 15 August - hence my inclusion in Saturday's programme. Before 1pm - Manfred Mann - Do Wah Diddy Diddy, (first jpeg) already on the Coast playlist as I was reminded when I got in there, so played that just before 1pm. 4pm Jerry Wallace - Primrose Lane (third jpeg) [originally a mono recording] the version I played was off the Collectables 6035 Primrose Lane, Very Best Of Jerry Wallce CD and was a remake, played slightly faster and was shorter in duration at 2:13 than the original at 2:25. UK#1(2) from 4 August and NZ#1(3) from 13 October 1966 - Monster Hit in N.Z. UK#1(3) from 5 August, Au#1(3) from 1 September and US#1(3) from 4 September 1965. The title song from this group's second film, it sold a million in one week in the States and 500,000 in the first week in Britain where it was an instant #1 also for 3 weeks. This group received 5 gold disc awards in 3 months; including this track, a US#1(1) 7 August 1965, and (eventual) 5th million-seller for the group with a song that had been made famous in 1911 by the cockney comedian, Harry Champion. Monster Hit in N.Z. US#25, with 14 weeks in the Top 100 from 7 August 1961. Backed with CRYIN’ which made the Top 100 one week later on 14 August and peaked higher at US#2. (16 weeks in the Top 100). The biggest Merseybeat group not managed by Brian Epstein. Formed in 1962 the group were signed to Pye in 1963 and put under the care of staff producer Tony Hatch and this was the first of six such production successes for him. A cover of a Drifters hit it became #1 the day of the Great Train Robbery - UK#1(2) from 8 August 1963 and a Monster Hit in NZ. and a US#4, UK#5 and NZ#1(1), 8 August 1968 - Monster Hit in N.Z. The article in Wikipedia says; "Though marketed as a band, it would be more accurate to say that the name "The Ohio Express" served as a brand name used by Jerry Kasenetz and Jeffrey Katz's Super K Productions to release the music of a number of different musicians and acts. 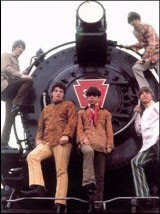 The best known songs of The Ohio Express (including their best scoring single, "Yummy Yummy Yummy") were actually the work of an assemblage of studio musicians working out of New York, including singer/songwriter Joey Levine." and the biggest Merseybeat group not managed by Brian Epstein - I did play The Searchers - Sweets For My Sweet. A regular on the Coast playlist.